Here are the top picks–at least from some members of the Inland Valley Daily Bulletin publication–for 2015 albums. Any questions, comments or hate please respond in the comment section. Below is an email interview with superstar DJ Paul Van Dyk, set to perform at Dreamstate in San Bernardino, that I was not able to use because of time limitations. For more information on the sold-out Dreamstate festival, head to http://www.dreamstateusa.com/losangeles/. Q: What is your name and where do you currently live? Q: You will be a headliner at Dreamstate USA in San Bernardino (and congratulations on that), which is being advertised as “your trance destination.” What is the state of trance right now compared to the past? Does it feel like a resurgence (or maybe its popularity never went down)? A: Everyone has their own take on that. For me, it feels like the popularity has remained far closer to ‘constant’, than ‘resurgent’. I do get though, more and more, the vibe from other people see it as resurgent. There’s lots of different ways to gauge that, but with trance-specific events like Dreamstate selling out in 4hrs, I do see where people are getting that feeling from. Q: What do you think of the concept of the all trance “Dreamstate USA” lineup in San Bernardino and San Francisco? A: It’s a very positive move. It’s giving something to the U.S. scene that’s been consistently enjoyed by people on other continents for well over a decade. That can’t be a bad thing. Q: Your Facebook lists your genre of music as “advanced electronic music”. Do you try and distance yourself away from the trance label (and if so, why)? A: Fans, media or anyone out there who refers to me as ‘a trance DJ’ or ‘a trance producer’, I have no problem with. The need to categorize is fundamentally human. Personally, I don’t need to box myself into anything more specific than the bracket of ‘electronic music’ though. I’ve worked for the freedom to produce what I like, when I like over a long period of time now. For me personally, constraining that frame any further is counterintuitive. Q: How important has social media been in your career? I ask because you have been around since the early 1990’s when there was no real online presence. A: Very important. ‘Revolutionary’ is not too big a word. Q: Do enjoy social media? A: Not so much enjoy as absolutely love it. It provides a barrier-free bridge between the people who follow what I do and myself… For an artist, you can’t get a better, more healthy ‘relationship’ than that. Q: What piece of advice would you give younger artists? A: Follow your heart, not the herd. Producing or play what feels really right inside, not what’s today’s trend. Once artists lose sight of that, they’re in great danger of beginning to chase their own tail. That produces a vicious cycle. Electronic music, by its nature, and over its history, has changed very fast. Once someone starts bandwagon-jumping a trend, they’ve unconsciously putting themselves on a road to obsolescence. They’re carbon dating their output and history’s not typically kind to those that have. Thus the best thing to do is to focus on what you, in your own mind, feels good and sounds right. That’s stood me well over the longer run. Q: You were an active participant in Rock the Vote in 2004 and 2008. Why is voting so important to you and what do you say to people who don’t feel it is as important? A: Voting is ones of the foundations of democracy. Freedom of speech and the right to vote are fundamental to making our society as fair and equal as possible. The thing is we are at the crossroads of where this world is going. There are many different ideas as to what should happen with this planet. If you go out and vote, you can have, at least a say in that. You are an importance, this importance is given to you by democracy and democracy is the best way for us all to live together on this planet. There are many countries in the world where people still don’t have any right to vote at all. So if you have the chance, go and do it. Q: With “The Politics of Dancing 3” is there a message or anything specifically you want fans to get out of it? A: There is, very much so. In Ibiza whilst DJing many a year ago, I watched Lebanese friends dancing with Israeli friends – without war, without anything in their minds other than treating each other respectfully. In 2015 the need for this type of diplomacy is even greater than it was in 2001. In a very personal respect I see what sort of potential electronic music has for uniting people who otherwise would not normally be united. It’s tremendously powerful in that way and that’s what ‘the politics of dancing’ really means to me. Q: It’s been 10 years since the last “Politics of Dancing 2” record. Why do a third edition now? A: Over the years many people asked if there would ever be another ‘Politics Of Dancing’. I’d thought about the idea myself and often. Three years back I finally decided ‘why not?’ If there was a project that we all still had so much enthusiasm for, that is requested by the audience regularly, and over such a long period of time, then really, what’s to stop it? Q: Are Southern California trance audiences different than other audiences you perform in front of? A: Not really, no. Back, a good few years ago, you used to see big, and I do mean really gulf-sized differences in how audiences reacted and responded at gigs. These days though, hardly at all – power of the internet, I think! Q: With the San Bernardino lineup, is there any other acts you’re looking forward to seeing? A: If I get the chance, I always like to catch what Ben Nicky, Giuseppe Ottaviani, Aly & Fila and Jordan Suckley are up to. Those guys never disappoint. A: ‘Politics 3’ will still be very much the focus into 2016. The tour has been going for 6 months now and in that time we’ve reached 30 different shores with nearly 60 shows. There’s still many more to reach in the first half of next year though. There are some new remixes of three of the album tracks out at the start of December too. I imagine they’ll all be getting dropped in San Bernardino next week. Hello everyone, The Inland Empire Music Now blog is back and a staff list of best albums in 2014 is an easy way to begin. We’ll jump right into it. Honorable mentions: Rosanne Cash: The River and the Thread (Blue Note); Lucinda Williams: Down Where the Spirit Meets the Bone (Highway 20); Tune-Yards: Nikki Nack (4AD); Jack White: Lazaretto (Third Man); Caetano Veloso: Abracaco (Nonesuch). Agree? Disagree? Let us know in the comments with your selections also. Atlanta hip-hop megastars OutKast and Minneapolis alternative rock pioneers The Replacements are absolutely HUGE gets (but not completely surprising as rumors have been out for awhile) while plenty of standouts in the undercard such as rock’s HAIM, electronic duo The Knife, indie pop’s Ellie Goulding, electrofunk’s Chromeo, indie rock’s Neko Case, soul singer Aloe Blacc (of Avicii fame) and even the Jon Spencer Blues Explosion. 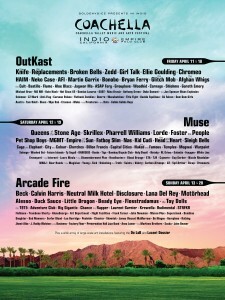 Other acts include Kate Nash, Anti-Flag, the Cult, Broken Bells and more. English rock band (and Coachella veterans) Muse returns as a headliner with Coachella veteran rock act Queens of the Stone Age (from nearby Palm Desert) but the biggest buzz might be for New Zealand indie/art pop’s Lorde (known for massive 2013 hit “Royals.” Additionally, dub step’s Skrillex, singer Pharrell Williams, DJ Fatboy Slim, hip-hop’s Nas (as well as Kid Cudi), electro pop’s Chvrches, garage rock’s Ty Segall, electronic pop’s Pet Shop Boys … the list of talented acts goes on and on. 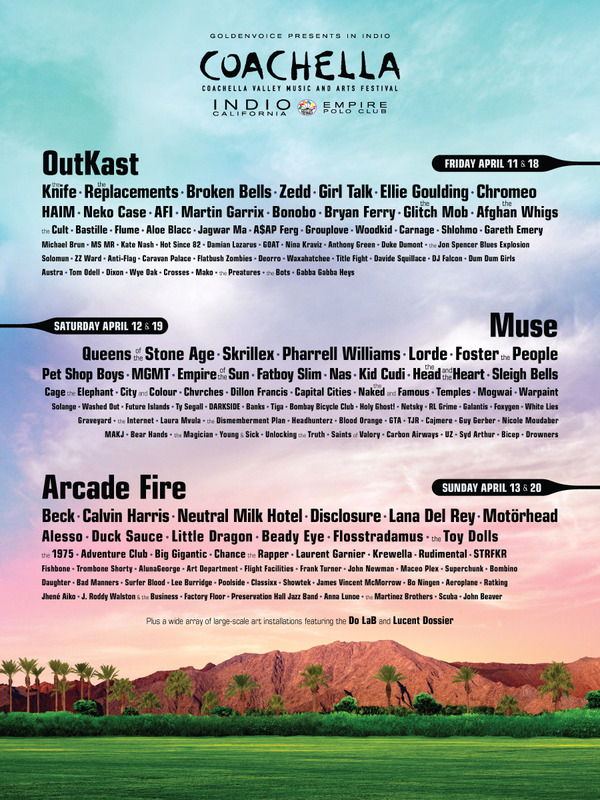 Canadian indie rock stars Arcade Fire returns as Coachella headliners as well as Los Angeles alternative rock’s Beck, Scotland electro house DJ Calvin Harris, a reunion of indie rock’s Neutral Milk Hotel and even English heavy metal band Motorhead. This doesn’t even take into account for new stars like Disclosure, veterans like Fishbone and rising stars like Chance the Rapper and Jhene Aiko. Outside of OutKast, one can argue the headliners (and a good chunk of the acts actually) aren’t anything new but all three days look really interesting this year (at least initially). I would have liked to see David Bowie, Daft Punk, Black Sabbath, Beyoncé, Rihanna or Kanye West on the bill but you can’t have it all I guess. It seems like they tried to add some more hip-hop this year also which I approve of. Festival passes for both weekends go on sale at 10 a.m. Friday but general admission passes for weekend one must be purchased as a shuttle combination, according to Coachella officials. The passes with shuttle combination are $435. All types of passes are available for weekend two (a general admission ticket is $375 with no shuttle combination), according to officials. Additionally, the price you see is the price you pay, according to officials. The festival is at 81-800 Avenue 51, Indio. 4. Castle – Rotten Sushi / The Mushroom Of Course! Chance the Rapper “Acid Rap” and Danny Brown “Old” because their voices annoy me but you can’t deny their writing abilities. 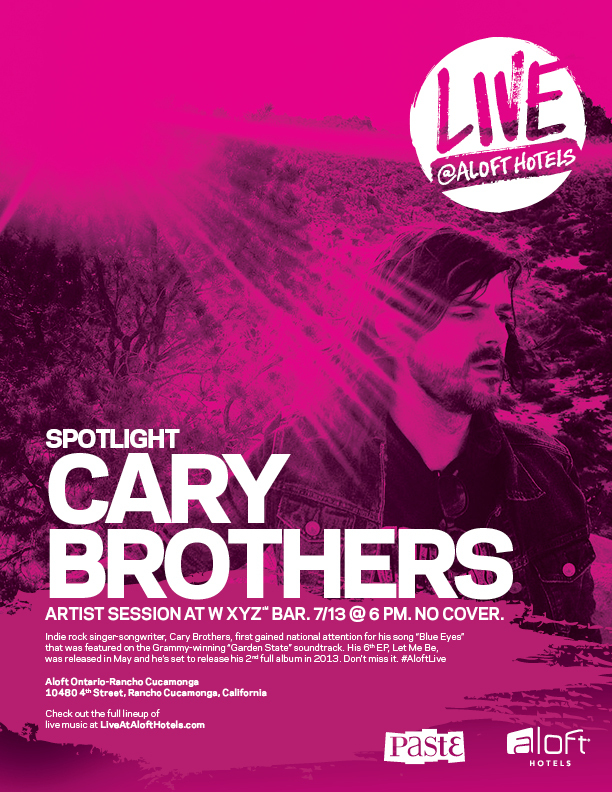 RANCHO CUCAMONGA – Cary Brothers, a Los Angeles based indie and alternative rock artist known for the 2004 song “Blue Eyes,” will play an acoustic performance at 6 p.m. Saturday at Aloft hotel. The hotel, near the northeast corner of Fourth Street and Haven Avenue, is at 10480 4th St.
Here’s a photo of Erykah Badu and Bobby V (taken courtesy of Bobby V and shared on Instagram) before the Badu’s show Thursday night at San Manuel Indian Bingo and Casino in Highland. The annual Stagecoach Country Music Festival makes its seventh trip to the Empire Polo Grounds this weekend with country superstars Toby Keith, Lady Antebellum and the Zac Brown Band, among others. The reunion of the Inland Empire’s The Honky Tonk Angels Band another attraction. The festival, featuring nearly 50 country acts, follows just a week on the heels of the two-weekend Coachella Valley Music and Arts Festival, held at the same location. “We all are obviously super grateful for this. You really don’t get a second chance in the music business,” said Kurt Ross, Honky Tonk Angels Band vocalist and Claremont resident, who added the group would play at 1:45 p.m. Saturday on the Palomino stage located inside the huge Sahara Tent. Other acts include Hank Williams Jr., Trace Adkins, Jeff Bridges & the Abiders, Dierks Bentley, Rodney Atkins, Darius Rucker, Thompson Square, Lonestar and more. Eventually the group, which blended Americana, rock and Southern rock, broke up and Ross is now a production manager who has been working at the Stagecoach festival since its first year. Ross said Stagecoach organizer Paul Tollett heard him sing vocals on the Unforgiven’s “Hang ’em High” at last year’s festival and asked him to put the Honky Tonk Angels back together. The three-day festival will be broadcast on AXS TV. For information on the live telecast, go to www.axs.tv, www.facebook.com/axstvconcerts or @AXSTV on Twitter.